During the pre-industrial age, cities were generally confined to major ports or capitals. The size of cities are correlated with economic growth, that’s why Beijing, China in its booming years in the 1500’s, was the world’s largest city with a population between 600 thousand to 700 thousand. Paris was the only European city to rank in the top 10 at the time with a population of 200 thousand. London was even smaller with a population of just 50 thousand! Economic growth promotes the expansion of modern industries and an increase in the urban population. You don’t have to look far back in history to notice this trend either. Chinese economic liberalization in the 1980’s has caused a massive way of migration of rural Chinese farmers in the west moving to Special Economic Zones on the east coast to work in manufacturing and other major industries. To sum this up simply: capitalism, the most productive economic system ever implemented, has driven urbanization through economic development. In the first images, the yellow dots collectively represent half of the American population. It shows where the most densely populated areas are. The second map shows 2016 presidential election results by county. They both bare a strong resemblance. 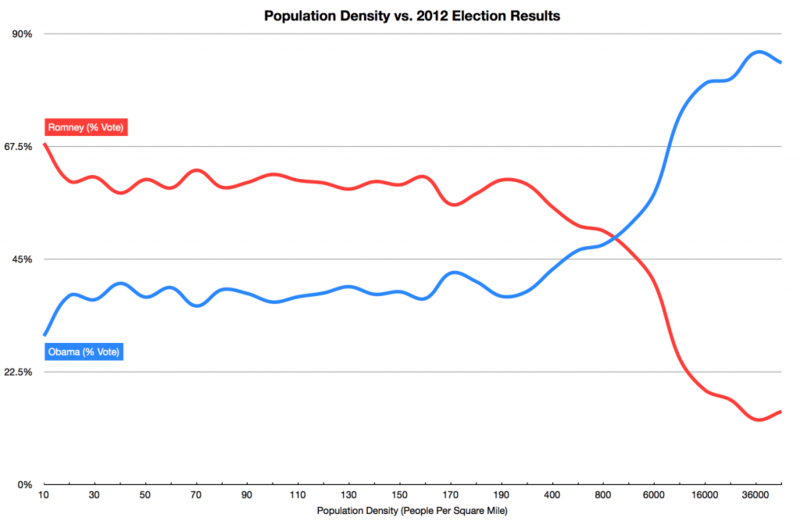 More urbanized areas vote Democrat while more rural areas vote Republican. In fact back in the 2012 election, 98% of the 50 most dense counties voted Obama. 98% of the 50 least dense counties voted for Romney. For the conservative proponents of free markets, they must keep in mind the effects of economic development and urbanization affect the politics of people. You must accommodate for it. And that means taking pragmatic policy positions on issues like welfare, gay marriage, and abortion. Reblogged this on Learning Hayek.